The pickup and drop off points for cruise ship passengers has changed effective September 2018. For more information please see Cruise Pickup and Drop Offs. CentrePort is focused on enhancing Wellington's profile and economy through our ongoing improvement with the cruise industry and our commitment to helping ensure Wellington is a cruise friendly destination. 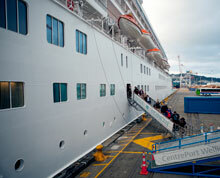 We work closely with international cruise liners and Positively Wellington Tourism to promote Wellington's cruise trade. CentrePort can provide a range of services to meet the specific requirements of cruise operators, including 24 hour security, baggage handling, gangway provision, border control inspections and entertainment. Please contact us if you have any questions about the services available. CentrePort allows accredited tour companies to collect passengers directly from the berth of the cruise vessel, below is the links to the booking system where details of tours and activities can be entered. Please note that the bookings will be filtered and only approved personnel will be permitted to enter CentrePort on the cruise day. If you are unsure if you are accredited or require any other information please do not hesitate to contact the CentrePort Cruise team. Shipping agents and vessel representatives for Cruise vessels please use these links to notify CPL of all activities taking place during the vessels time on berth.